Although we are entering a challenging month, the March Moon phases are ready to guide you through the best of ways. 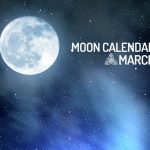 Check out the lunar calendar for March 2019 and then see how to plan and act following the recommendations for each cycle of this month. In March, the New Moon begins on the 6th and, with it, begins a cycle of changes. This is a time where you will have the opportunity to regain your energies and feel ready for another planning period. If you have some goal to be completed by the end of the month, you better start moving now. You do not have to stress, just start preparing to do everything you have in mind for March. On March 14, the Crescent Moon appears to announce the practical phase of its plans, projects and wishes. If there is something that, for some reason, has been left out in recent months, it is time to handle it (as long as it’s really worth it). March promises to bring a new lifestyle to the surface, something that may come good, but it will certainly be difficult to adapt. This change could be a new health habit, a new job (or the opening of a new business), or even the formalization of a relationship that was informal. The Full Moon is a time expected by many people, whether for rituals or simply to receive all the energy of that period. From the 20th, you may be in a more vulnerable aspect in situations that require rationality; this is because the Full Moon tends to make people more emotional. At work, try to focus and stay calm. To succeed, you need to be more tactful with people. The last lunar phase of March is also its last cycle. On the 28th, the Waning Moon begins a brief period of rest. This is the best time to end open issues, and if it is the case, get rid of things and people that are causing you some harm. If there is any particular person emanating some sort of negative energy from you, it is time to move away from it and protect yourself. Take the week to reflect on your past attitudes and future plans. March, although inspiring, will be a month of challenges and trials. You will find moments where unforeseen events may occur, but everything will work. The stars may surprise you many times, but in all of them the lesson taught will make you stronger. March will be a month to put life in order, making it more independent and autonomous, especially in sentimental terms. Some adaptation periods will be necessary. It is fundamental for a solid foundation to be built in the coming months. This will be a month of great creativity, and you can make use of it to get what you want – or at least give a shot to your initial plans.